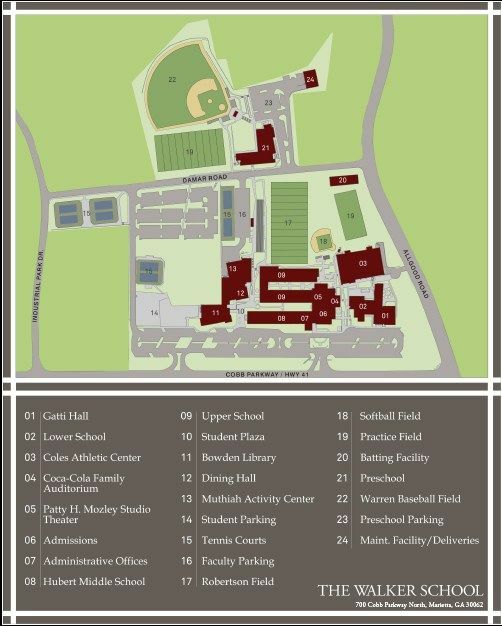 Directions to our Main Campus are below. Our Primary School campus is located at 830 Damar Road behind our Main Campus . Follow I-75 North to Exit 265 for GA-120 Loop. Turn left onto North Marietta Parkway. Turn right onto Cobb Parkway. After the intersection of Cobb Parkway and Allgood Road, Walker will be immediately on your right. Follow I-75 South to Exit 267B for US-41 toward GA-5 S. Turn left onto Cobb Parkway, and Walker will be down the hill on your left. Take North Marietta Parkway / 120 Loop. Turn left onto Fairground Street. Take the first exit through the traffic circle onto Allgood Road and use the second from the left turn lane to turn left onto Cobb Parkway. Walker will be immediately on your right.